Have you ever been troubled by not having any change to give to someone in need? Reaching into an empty pocket and coming up empty when you knew you can afford to spare a little change for someone down on their luck? That feeling of helplessness was the beginning of Happy Face Coins. We went home one day thinking about the fellow we had stiffed for a few coins because we lived on plastic and rarely touched paper money or change anymore. Thinking about our feelings of helplessness we decided to be prepared the next time someone asked us for a little spare change. We stopped at our bank on our way that day and got three rolls of quarters. 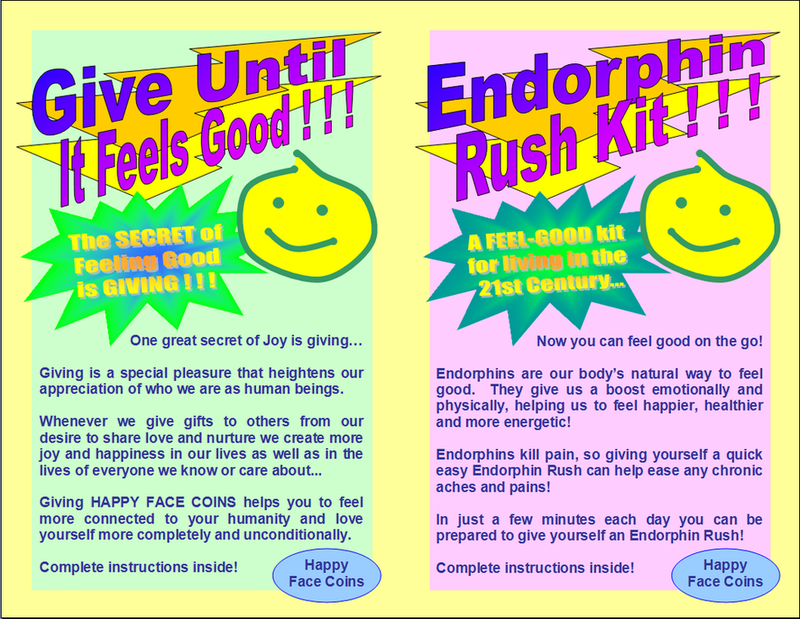 When we got home we designed the happy face coins wrappers featured in our brochures. We printed some wrappers, cut them apart and began folding. We put three quarters in the pouch of each gift pack we wrapped that night. The next day we pased the same gentleman we had passed on our way to work the day before. He appeared lame. He had a haunted look about him, as if he were a war veteran. But that wouldn't have mattered. We value all people regardless of who they may be or why might be asking for a small hand-out. Watching this man's face filled us with emotions. We could read the faces of passers by reflected in the face of this lone man caught in a storm of emotions. Each passing stranger left an impression on this man's heart that could be read in his face. Often there was anger or resentment reflected there, but the man withstood the cold looks or averted eyes without judging, just accepting that some people were inconvenienced by his presence and the guilt in their hearts when they failed to spare him a few coins or even just a few kind words. Occasionally the man's face would light up as someone who knew him stopped to say hello and to spare him a little change. As we approached we felt a little timid. We were about to do something that would change our life forever. We had given spare change to panhandlers before, that was something we hadn't always done before, but it was something we usually wanted to do when an opportunity to do so had arisen in the past, only now it felt like we were looking forward to an occasion to give a little money away. At first the panhandler was confused when we put our gift in his paper cup. He could feel the weight of the coins as our gift dropped into his cup. He said thank you reflexively, but then he seemed confused that there was no jingle of change. He looked like he would get angry when he looked into his cup, but his curiosity got the better him. As he saw the happy face design his face brightened a little and he unwrapped the gift pack carefully because his fingers already could feel what his eyes could not yet see, the coins inside the gift package. The man's face lit up as he understood what we had done. We had made a gift just for him. And we had. We had taken the time to think about him and do something to reach him as a human being. We had given the man more than a few coins. We had given him our love as well as our kindness and compassion. Weeks later we had an occasion to speak with the man away from the rush-hour foot traffic of people scurrying to work. He had collected our coin wrappers to share and tell the story about how he got them and what they meant to him. He shared them with other people also down-on-their-luck. We continued giving the happy face coins gift packets away and one day a new stranger's face lit up when we handed him a packet of coins. Our simple gifts had made us a little bit of an urban legend from the first day we began to give our coins away a few at a time, wrapped with love for humanity. You don't need our coin kit to start sharing the joy. Make up your own kits! Use your own logo! Put your own personal message of love in the hands of someone who really needs a little of your kindness and compassion. - Enjoy! And just in case you like our design, feel free to print the example below as often as you like. Its available in the complete kit above or click the image below to open only the gift-wrapper PDF template in your browser.